I arrived home last Friday night to a parcel from the lovely folk at Stone & Wood. Inside were two bottles of their latest limited release pleasantly titled ‘Forefathers’. The concept is very simple and the label best describes the annual release as a ‘Thank you to those who paved the way’. 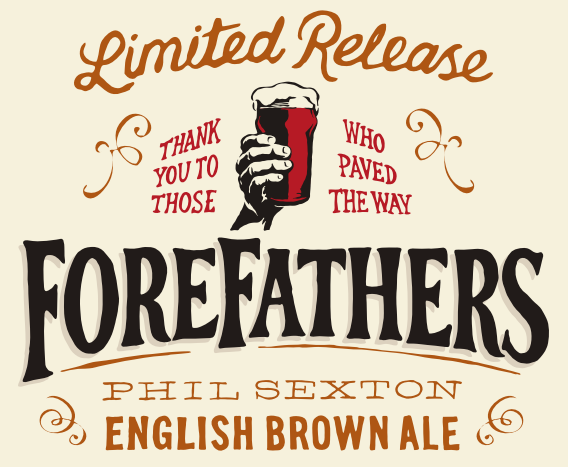 The 2015 Forefather is Phil Sexton. Phil is an entrepreneur, a brewer and co-founder of Matilda Bay and Little Creatures – two key elements of Australia’s beer movement. There’s no doubt that he’s one heck of a leading light. Heavily influenced by his time spent in the UK and the US, Phil Sexton was instrumental in leading Australia into its current beer revolution. I enjoy Stone & Wood’s limited releases. I like the quirkiness they bring. This one comes off the back of the successful Beers of the Earth range. Whilst the Beers of the Earth were a one-off, the Forefathers releases can and hopefully will continue for many years. There will be an air of ‘I wonder who’ll be next’ among the beer geeks every year no doubt. I’m hoping it’ll be a crazy-arse take on Brad’s original Pacific Ale recipe. We’ll see. 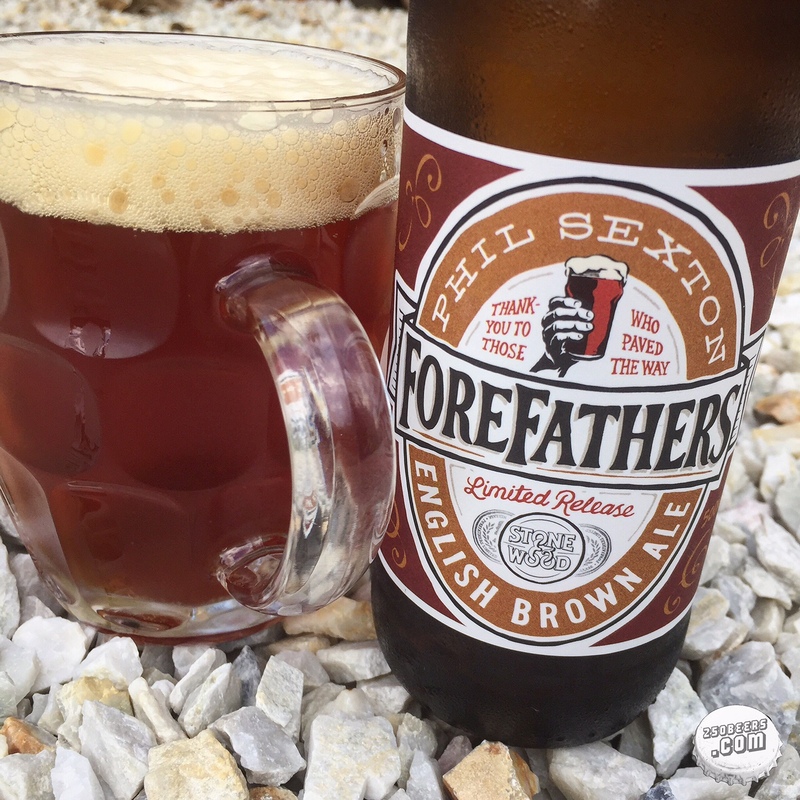 In the meantime, let’s enjoy this current brew – in the style of an English Brown Ale – before it vanishes. Phil, along with his son Harry, mucked in and helped brew it at Stone & Wood’s Byron Bay brewery. Evidently, Phil loves a brown. Having made one of my bottles disappear as the sun did likewise yesterday, I thoroughly enjoyed it. There’s a distinct lack of good brown ales out there. In fact, I can count on one hand the number of mindblowing browns I’ve had over the past year. I enjoyed the caramel and the nuttiness and also garnered hits of toffee as my mind started to wander through browns of old. I can’t say that I got much in the way of spices or blackcurrant however all in all it’s a solid, 4.8% abv brown and it’ll be worth hunting down if you’re a fan of the style. For those wanting to know which hop varieties feature you’re in luck…Challenger, Bramling Cross and East Kent Goldings. Phil Sexton English Brown Ale is available across the country from today (Monday 24th August) in kegs and 500ml bottles. Head HERE to Stone & Wood’s beer finder to locate your nearest stockist. With Father’s day on the horizon, Stone & Wood are offering a special Forefathers gift pack which will include two 500ml bottles and a cap for $49.95. Available at their online store HERE. « Who the firkin hell is…Ewen Davies?